SAN FRANCISCO, Calif. – Nov. 21, 2017 – Salesforce (NYSE: CRM), the global leader in CRM, today announced results for its fiscal third quarter ended October 31, 2017. Revenue: Total third quarter revenue was $2.68 billion, an increase of 25% year-over-year, and 23% in constant currency. Subscription and support revenues were $2.49 billion, an increase of 25% year-over-year. Professional services and other revenues were $194 million, an increase of 20% year-over-year. Earnings per Share: Third quarter GAAP diluted earnings per share was $0.07, and non-GAAP diluted earnings per share was $0.39. Cash: Cash generated from operations for the third quarter was $126 million, a decrease of 18% year-over-year. Total cash, cash equivalents and marketable securities finished the quarter at $3.63 billion. Deferred Revenue: Deferred revenue on the balance sheet as of October 31, 2017 was $4.39 billion, an increase of 26% year-over-year, and 24% in constant currency. Unbilled deferred revenue, representing business that is contracted but unbilled and off balance sheet, ended the third quarter at approximately $11.5 billion, up 34% year-over-year. As of November 21, 2017, the company is initiating revenue, earnings per share, and deferred revenue guidance for its fourth quarter of fiscal year 2018. In addition, the company is raising its full fiscal year 2018 revenue and earnings per share guidance, and maintaining its operating cash flow guidance, previously provided on August 22, 2017. The company is also confirming its full fiscal year 2019 revenue guidance, previously provided on November 6, 2017. Q4 FY18 Guidance: Revenue is projected to be $2.801 billion to $2.811 billion, an increase of 22% to 23% year-over-year. 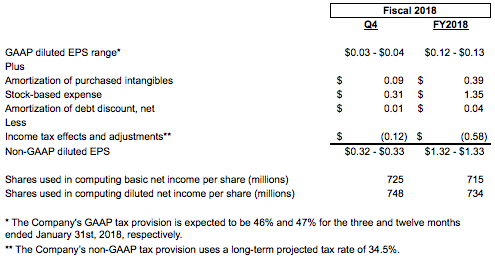 GAAP diluted earnings per share is projected to be $0.03 to $0.04, while non-GAAP diluted earnings per share is projected to be $0.32 to $0.33. On balance sheet deferred revenue growth is projected to be 19% to 20% year-over-year. Full Year FY18 Guidance: Revenue is projected to be $10.43 billion to $10.44 billion, an increase of 24% year-over-year. GAAP diluted earnings per share is projected to be $0.12 to $0.13, while non-GAAP diluted earnings per share is projected to be $1.32 to $1.33. Full Year FY19 Guidance: Revenue is projected to be $12.45 billion to $12.50 billion, an increase of 19% to 20% year-over-year. The company plans on providing its expectations for FY19 GAAP EPS, non-GAAP EPS, and operating cash flow when it announces its fourth quarter and full fiscal year 2018 results in February 2018. Salesforce will host a conference call at 2:00 p.m. (PT) / 5:00 p.m. (ET) today to discuss its financial results with the investment community. A live web broadcast of the event will be available on the Salesforce Investor Relations website at www.salesforce.com/investor. A live dial-in is available domestically at 866-901-SFDC or 866-901-7332 and internationally at 706-902-1764, passcode 9689558. A replay will be available at (800) 585-8367 or (855) 859-2056 until midnight (ET) Dec. 21, 2017. "Safe harbor" statement under the Private Securities Litigation Reform Act of 1995: This press release contains forward-looking statements about our financial results, which may include expected GAAP and non-GAAP financial and other operating and non-operating results, including revenue, net income, diluted earnings per share, operating cash flow growth, operating margin improvement, deferred revenue growth, expected revenue run rate, expected tax rates, stock-based compensation expenses, amortization of purchased intangibles, amortization of debt discount and shares outstanding. The achievement or success of the matters covered by such forward-looking statements involves risks, uncertainties and assumptions. If any such risks or uncertainties materialize or if any of the assumptions prove incorrect, the company’s results could differ materially from the results expressed or implied by the forward-looking statements we make. The risks and uncertainties referred to above include -- but are not limited to -- risks associated with possible fluctuations in the company’s financial and operating results; the company’s rate of growth and anticipated revenue run rate, including the company’s ability to convert deferred revenue and unbilled deferred revenue into revenue and cash flow, and ability to maintain continued growth of deferred revenue and unbilled deferred revenue; foreign currency exchange rates; errors, interruptions or delays in the company’s services or the company’s Web hosting; breaches of the company’s security measures; domestic and international regulatory developments, including the adoption of new privacy laws; the financial and other impact of any previous and future acquisitions; the nature of the company’s business model, including risks related to government contracts; the company’s ability to continue to release, gain customer acceptance of and provide support for new and improved versions of the company’s services; successful customer deployment and utilization of the company’s existing and future services; changes in the company’s sales cycle; competition; various financial aspects of the company’s subscription model; unexpected increases in attrition or decreases in new business; the company’s ability to realize benefits from strategic partnerships and strategic investments; the emerging markets in which the company operates; unique aspects of entering or expanding in international markets, including the compliance with United States export control laws, the company’s ability to hire, retain and motivate employees and manage the company’s growth; changes in the company’s customer base; technological developments; litigation and any related claims, negotiations and settlements, including with respect to intellectual property matters or industry-specific regulations; unanticipated changes in the company’s effective tax rate; factors affecting the company’s outstanding convertible notes, term loan, and revolving credit facility; fluctuations in the number of company shares outstanding and the price of such shares; collection of receivables; interest rates; factors affecting the company’s deferred tax assets and ability to value and utilize them; the potential negative impact of indirect tax exposure; the risks and expenses associated with the company’s real estate and office facilities space; and general developments in the economy, financial markets, credit markets and the impact of current and future accounting pronouncements and other financial reporting standards. • Income Tax Effects and Adjustments: The company utilizes a fixed long-term projected non-GAAP tax rate in order to provide better consistency across the interim reporting periods by eliminating the effects of items such as changes in the tax valuation allowance and tax effects of acquisitions-related costs, since each of these can vary in size and frequency. When projecting this long-term rate, the company evaluated a three-year financial projection that excludes the direct impact of the following non-cash items: stock-based expenses, amortization of purchased intangibles, amortization of acquired leases, amortization of debt discount, gains/losses on the sales of land and building improvements, gains on sales of strategic investments, and termination of office leases. The projected rate also assumes no new acquisitions in the three-year period, and considers other factors including the company’s tax structure, its tax positions in various jurisdictions and key legislation in major jurisdictions where the company operates. This long-term rate could be subject to change for a variety of reasons, such as significant changes in the geographic earnings mix including acquisition activity, or fundamental tax law changes in major jurisdictions where the company operates. The company re-evaluates this long-term rate on an annual basis or if any significant events that may materially affect this long-term rate occur. The non-GAAP tax rate for fiscal 2018 is 34.5 percent.